A 2016 Pew Research Center study found most Democrats and Republicans held “very unfavorable” views of the opposing party. America is more politically polarized now than most of us can even remember. Does that polarization play out beyond the spectrum of political values? Do our “cultural preferences” — the entertainment we like, the media we watch — also reflect a deeply divided nation? Do our media choices correlate to our beliefs about society, issues and government? 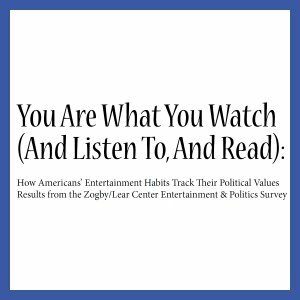 Our 2008 Zogby/Lear Center survey included questions about leisure-time activities and favorite radio and TV shows, Web sites, movies, games and sports. Read those results here. Our newest project, the Media Impact Project, grew directly from this initial interest and work regarding what entertainment choices mean for politics, and what our political leanings say about our entertainment preferences. Explore the projects MIP is currently working on. Read: The Generational Divide: How Deeply Do Women Differ?